Every day at BridgeAthletic headquarters, we hear tales from coaches and athletes across sports of how Bridge programs have helped them - by making the athletes stronger, the coaches wiser, or the team more unified and confident than ever. These are stories of championships, obstacles overcome, and goals achieved. It’s what keeps us doing what we do every day, striving to build better athletes across sports and around the world. But instead of keeping these tales of glory and greatness to ourselves, we’d like to share them with you through our #BridgeBuilt series featuring a team or athlete that has achieved great results while using the BridgeAthletic platform. 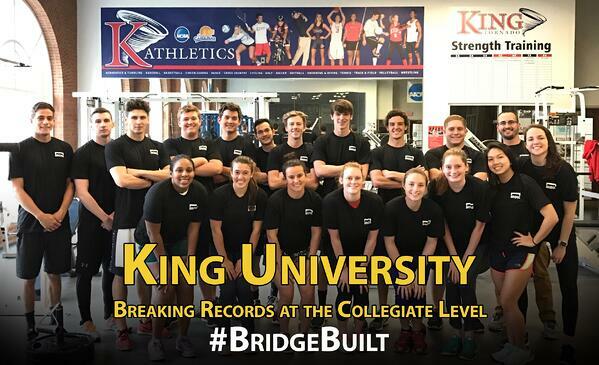 King University is a growing NCAA DII program in Bristol, TN. Coach Jordan Schrotenboer and his staff are doing everything possible to improve overall performance of the King Tornado athletes. This year alone, the athletes have set school records in 17 events, many of which have been broken multiple times and traded back and forth between athletes. Looking back on the season, Schrotenboer was pleased with the progress that had been made. When asked about how Bridge has supported his efforts to build better athletes, Coach Schrotenboer emphasized the “big impact” that the platform had on his team’s development. Three of the areas that were particularly impactful were the personalized, stroke-specific programming, the remote training capabilities, and the data tracking. Bringing in a training plan that was built for elite swimmers, specifically addressing weaknesses developed by years in the pool, was key to taking his athletes to the next level, both in the water and out. Relatedly, it’s not just the times that Coach Schrotenboer keeps track of anymore. Now, with the complete dashboard that shows the athletic development of his athletes in the weight room, he is able to compare gains in the pool with gains in the gym. Finally, Coach Schrotenboer emphasized the development of this swimmers not only as athletes, but as students. Realizing the academic demands on his athletes are the highest priority, he can still be sure that each member of the team gets a full workout in through the mobile training interface. Whether it’s improving in the classroom, the weightroom, or the pool, the King University athletes have put in one of the best years ever for their institution. Our biggest congratulations go out to Coach Schrotenboer and all the record-breaking Tornado swimmers! Keep up the great work!